In translating traditional Taiwanese craft techniques into contemporary design objects, designer Rock Wang muses on the country's most popular vehicle with this art deco piece. 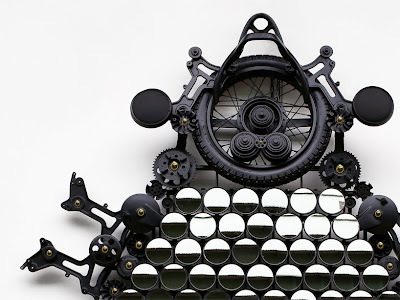 The large instillation was constructed in partnership with craftsmen Cheng-yao Chiang and lead designer Gijs Bakker, using parts of an SYM Wolf 125 Motorcycle and 140 readymade motorcycle rear view mirrors. Motorcycles are one of the most affordable forms of motorised transport in many parts of the world and, for most of the world's population, they are also the most common type of motor vehicle.